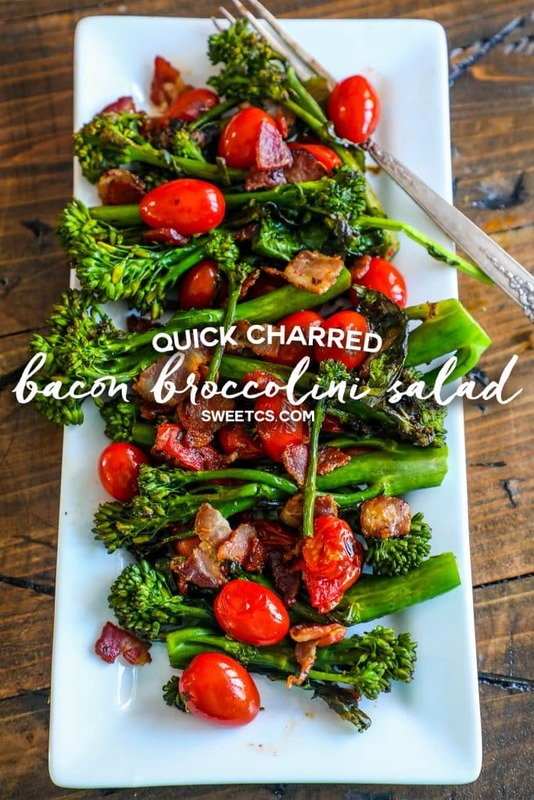 This Bacon and Broccoli Charred Salad is a delicious, colorful side dish that is perfect alongside lobster, steak, chicken, pork and fish! 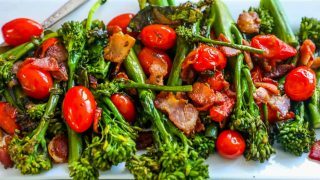 While most people know broccoli and make it often, I have started to love making broccoli’s slightly more posh cousin – broccolini! 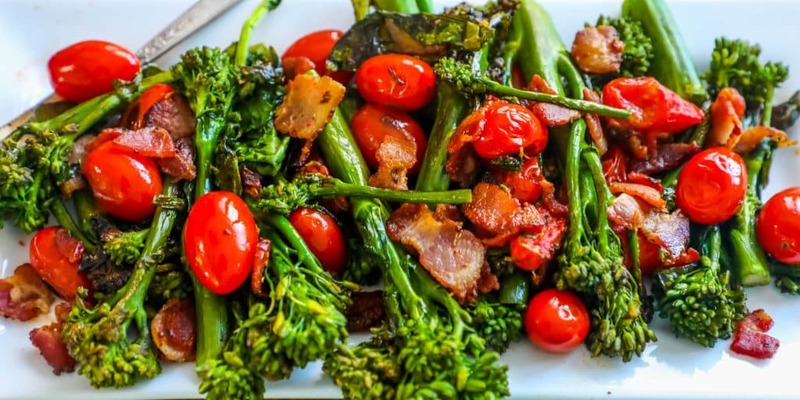 Broccolini has become fashionable and trendy in many restaurants, and is much more widely available than ever before thanks to it’s popularity. 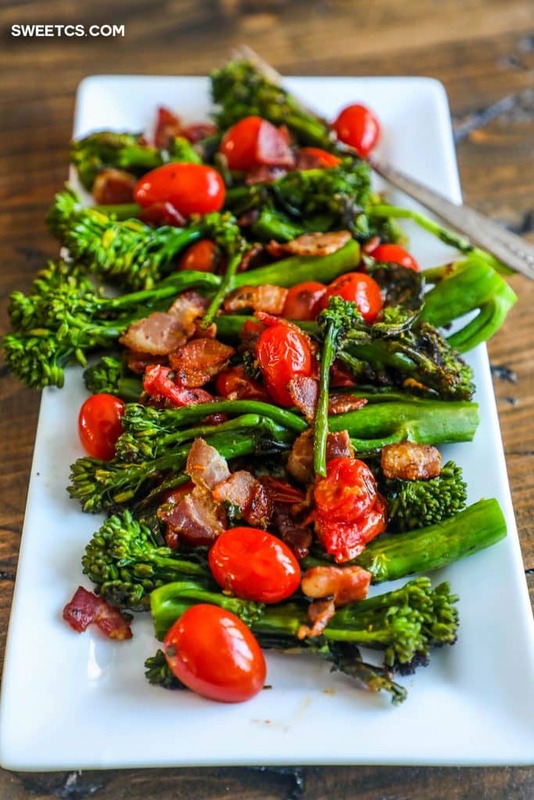 It is a delicious alternative to broccoli, whose smoky and rich flavor is only magnified when slightly charred and paired with crispy, thick cut bacon in this bright and easy Charred Bacon and Broccolini Salad side dish! Broccolini is thinner, with long stalks and tender tips that are almost like a broccoli-asparagus mix. It’s flavorful, rich, crunchy, and goes perfectly alongside meaty main dishes. 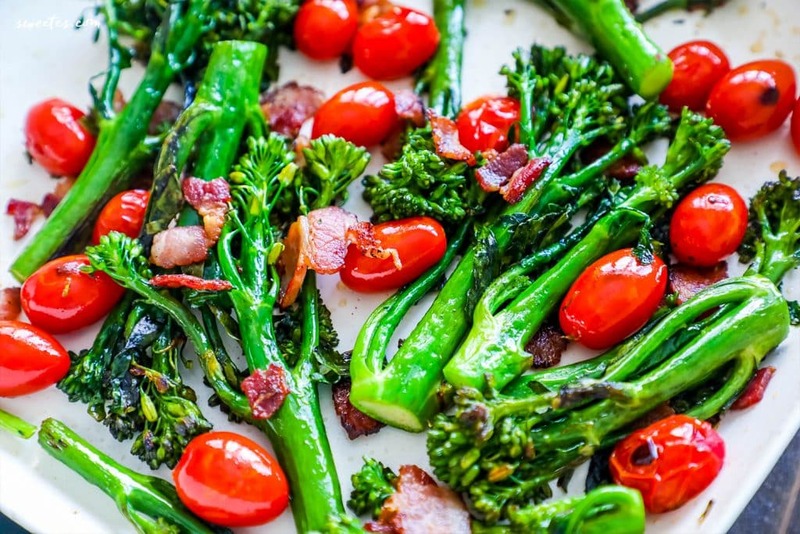 Broccolini is a meatier alternative to broccoli – and a little bit fancier than the shorter, squattier cousin. It is perfect for fancy dinners and dinner parties – like the Romantic 3 Course Valentines Dinner Party roundup I am featuring on Sweet C’s! Cut bacon into small bits, about 1/4". Add bacon to pan and cook on medium high until lightly browned (do not cook all the way to crisp). Add broccolini and let soften, stirring only occasionally. Add cherry tomatoes and garlic powder, and cook until cherry tomatoes begin to pop and char. Serve hot alongside your favorite main dish!